In this case you needn’ to be worry, all your books bought from Amazon are kept by Amazon cloud library. You can re-download these books to your Kindle anytime. Go to the home screen of your Kindle. Click “My Library” which is in the upper left corner. You can see two tabs: “All” and “Downloaded”, please check the items under “All”. All the books bought from Amazon will be displayed under “All” tab, find the book you want to recover, tap the cover and it will start downloading to your Kindle. If you are using Kindle Paperwhite 1 and previous generations, you can see “Cloud” and “On Device” tabs at Kindle’s home screen, go to “Cloud” tab to find the bought but deleted books. This kind of books are also stored in Amazon cloud library, you can recover them with the steps above. If you have no idea what is Send to Kindle service, please check this page. This is the most troublesome situation. Because the sideloaded books are onlu saved in Kindle’s storage, not on cloud. Which means, you have nowhere to recover the deleted files. 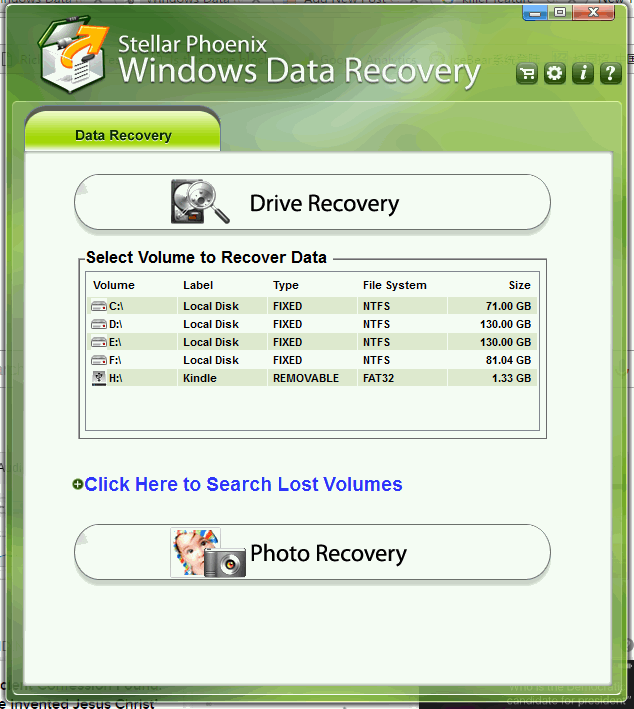 But we have data recovery software which can do this. Considering scan speed and depth, this software has the most powerful engine. It supports external drive, like USB drive, mobile phone, SD/TF card, and Kindle. 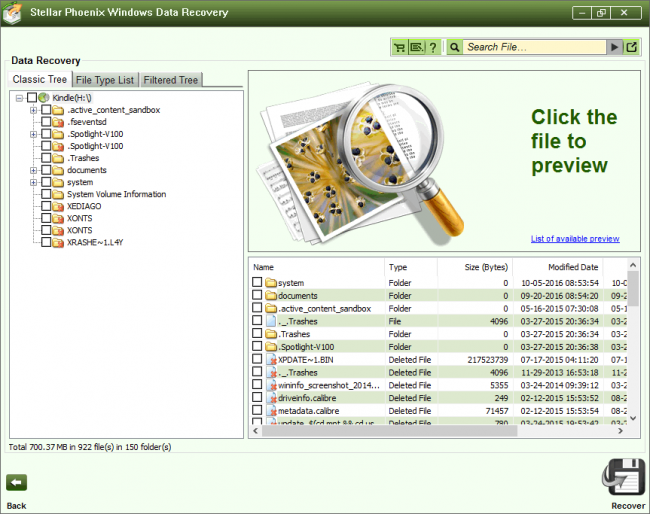 It recovers deleted files without any damage. To recover deleted sideloaded books with this software is very simple. First I launched this software, then plugged my Kindle to my PC, the software detects the Kindle immediately. Choosing the Kindle drive, an external interface pops up and asked me to choose which type I want to use. The scan speed makes me amazing! It only takes less than 5 seconds to scan the entire Kindle! Then you just tick the files or folders you wan to recover (Kindle saves books in documents folder by default), then click the “Recover” button which located in the right bottom corner, and choose the recover path. With the link above you can buy this software with 30% off discount. It’s an exclusive offer by my blog. Original price is $49, you can get it with $34.30. I recommend you install the free trial version at first, the free version can scan your drive but can’t do the recovery job. So if the free version finds your deleted book, you can buy a license to use the recover feature. If you only need to recovery data from your Kindle (or other external drive), you can also choose the SysTools Pen Drive Recovery, you can buy it with $33.15 (I requested 15% off from the vendor), however, it can’t work with your computer’s hard drives.